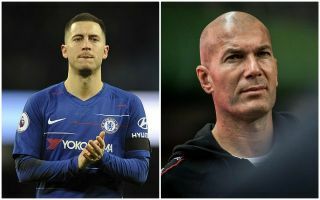 Zinedine Zidane is reportedly ready to sacrifice the development of two top Real Madrid youngsters in Marco Asensio and Vinicius Junior as he lines up the summer transfer of Chelsea star Eden Hazard. The Belgium international has long been linked with the Spanish giants as he’s allowed his contract to run down to just over its final year, and Zidane’s return to the Bernabeu will surely only help their cause. The latest from Diario Gol just shows how eager Zidane is to work with Hazard, as the report states he’s prepared to make the Blues forward a priority over giving more valuable minutes to Asensio or Vinicius. This seems a risky strategy from Los Blancos, who have a history of favouring big names over developing youth, with Asensio and Vinicius certainly both world class players in the making. However, it may well be that both will end up fulfilling their potential elsewhere if Hazard joins, with another previous Diario Gol report stating the Brazilian starlet would likely leave on loan were the 28-year-old to come in and threaten his place. Asensio, meanwhile, has been linked with both Manchester United and Liverpool in a recent report from Don Balon. This could come back to haunt Real, though they’ll also argue they need ready-made world class players like Hazard now after failing to replace Cristiano Ronaldo since he joined Juventus last summer.